Versatile Lighting Accessory: this lighting fixture befits all kinds of decor settings and can be featured at living room, bedroom, library, entryways, etc. A sleek light walnut tripod base suits a variety of settings from contemporary, rustic, transitional to loft style. The legs attach to a metal disc that supports the socket and white textured linen shade for easy assembly. Overall height is 25”and the tripod base has an 8.5” footprint. A sleek, decorative brown fabric covered cord hangs down from the socket. A three-way rotary switch on the socket controls a bulb up to 100 Watts or an equivalent CFL. The 3-way rotary socket switch will only work with a 3-way light bulb, otherwise this lamp will function with simple on/off switch at its highest setting. This lamp is smart outlet compatible. Bulb is not included. Adesso, meaning 'Now' in Italian, is headquartered In New York City, the design center of the USA. 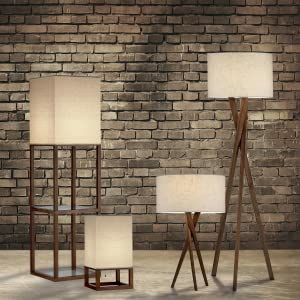 Adesso’s specialty is designing fresh, contemporary, affordable lighting and furniture. 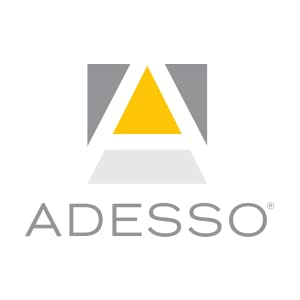 Adesso is a design driven company with a proven global appeal and is established as a dominant supplier of task and floor lighting in low, mid and high level markets. 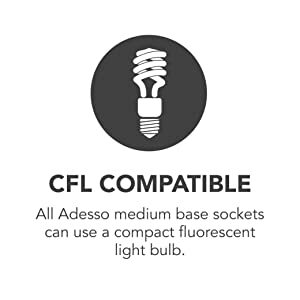 Adesso, an LED pioneer in the US lighting industry, was shipping portable LED product since 2003 and now has a vast, progressive LED assortment that is top notch in the industry. Adesso's success is the fruit of innovation, contemporary craftsmanship, high quality product, and our ability to provide high design to the masses. VERSATILE MODERN ARCH LAMP, HEAVY MARBLE BASE- The Mason LED Floor Lamp works well with a variety of interior design styles such as urban, traditional etc. It's beautiful, heavy marble base ensures it stands solid even if knocked. Add elegance to your home or office with its hanging double lamp shade and curved pole. It will look great in your living room, bedroom, den, office, game room, nursery, dorm, or any other room. 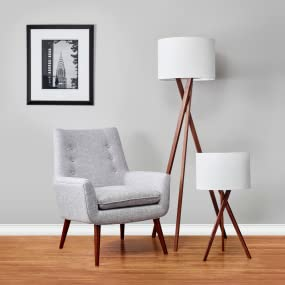 FITS EASILY NEXT TO A COUCH, SIDE TABLE, BED, OR DESK: The gentle arc of this lamp curves the light of its unique cylindrical shade into an overhead position that telescopes up to 49 inches from the pole so that you can easily angle it over any furniture piece to position the light perfectly. It reaches a height of 81 inches which makes it the perfect overhead lamp for rooms with high ceilings. The rounded base has a 15" diameter and is 2" tall so that it slides easily underneath furniture. GORGEOUS CYLINDRICAL LAMP SHADE & MARBLE BASE: The Mason Floor Lamp’s unique double cylindrical lamp shade measures 19 inches in diameter and 22 inches in height. It sits beautifully atop a stainless steel pole with a weight, marble base. The lampshade opens up at the top and bottom which diffuses the light and gives any room sufficient lighting with a calm, ambient glow. The neutral tones of this lampshade allow it to easily match and coordinate with any décor. LONG LASTING & ENERGY SAVING INDOOR LAMP: This Lamp includes a 9.5 Watt power saving LED light so that you will never have to replace a bulb. It’s advanced 3,000K warm white LED technology with 800 lumens allows this lamp to outshine lamps that depend on short lived, energy consuming standard halogen or incandescent bulbs. This LED lighting will endure for more than 20 years without burning out or overheating. Save money and energy with the Mason LED Floor Lamp. Max Wattage 60 W CFL. Trust material : The lamp body is made of plywood, firm and chemical-free. Material of the lampsade is fabric cloth, classical and elegant. Easy to use and store:The lamp is adjustable,you can adjust the angle and height as you like. With the special design, it can be stored in a small space. Features:AC 110-220V ,E26 screw socket easy to install,1.6m cord with button switch.Suitable for living room ,bedroom,office and so on . Note: we do not include the led light bulb(cause the led bulb easily broken through the transportation), please use your own led light bulb. Need to diy: this DIY man floor lamp body and lampshade are packaged in pieces, when you receive the parcel you need to build this lamp by yourself . Creative Design:Modern cute adjustable design that can be changed into any posture like the real dog, well as bedside table lamp; try it with your office, bedroom, or study, never out of date. Ideal as holiday dog lovers gift, birthday present for children,kids. 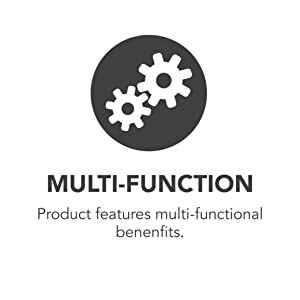 Full Function: 3 gears dimmer touch control, can be care with your eyes when you are reading . Material:Asche wood;It has a strong anti-decay function and very easy to be cut and polished; The texture of the wood is very natural and beautiful. Placement of the dimmer switch:the on/off switch is on the top the dog head which is very convenient.When turn on/off the lamp just like touch the dog's head,very funny and special . Special Point:the whole body of the lamp can be a justed into many actions like the real dog ,this lamp can bring a real feeling that you are keeping a pet dog.